I am continually reminded I should spend more time writing. As the semester has come to a close and another about to begin and I have been busy as always I have pushed this off to the side. In the midst of all of this, I’m always asking myself what more I can do to improve, and I think this blog is just one way for me to do that. On top of that, I have studied so much more music and learned a lot that I really want to write about. Time to finish this project. Gau is the first child to join the group. Playing through the game for the first time this didn’t really catch me off guard at all, but processing this now. . . It’s a kid, in a world-destroying war where a human-like magical race is being used and abused for their powers and being thrown out as soon as their energy is gone. A war controlled, really, by one man motivated solely by chaos, the belief in a lack of order, and with no faith in humanity. That’s pretty dark to add a kid into the protagonist party and his story makes it even worse. Gau is randomly found in the Veldt (which is just as African-inspired as would be expected) during battles. He doesn’t know how to talk completely and knows just a few words to get his point across, but one can get the idea that he is starving. The only way to get him to join your party is to go to the Arabian-inspired town in the North-East (what a coincidence…), buy some meat, and toss it out to Gau. Once he joins the party, he has a very interesting mechanic in battle that gives the player a better idea on how he is alive. Gau learns moves (non-magical) from enemies and mimics them. This gives the idea that Gau is extremely intelligent and it’s that very thing that had kept him alive in this desert for such a long time. Gau is probably the only character that doesn’t have an obvious reason to hate the Empire. His mother died from his birth, leading his father to go insane. The only reason that he seems to be motivated to fight with the party is his attachment with Sabin and Cyan. Not to make that sound like a weak reason though, living on your own in a desert for your whole life would probably be a little lonely. I would most likely want to stick around with the people that actually did something for me. The main thing I enjoy in the art is the “spark” of intelligence that can be seen from the Amano artwork of Gau. On top of that it also seems he either found or learned how to give himself some clothing which from my experience isn’t all that easy. Gau’s Theme also attributes to catching one off guard. His theme is a solo melody with accompaniment. The first solo instrument to play is the ever mature, beautiful, intelligent sounding cello, eventually passed on to a flute with a more full accompaniment. It kind of expresses what Gau is really like despite his whole living-in-the-desert-by-himself problem. This is one of the great moments in this soundtrack that can really make one stop and think about what this story has to say. Gau is the most caveman-like of everyone and has had the simplest of lives based solely on survival. This in mind, it is obvious that his only want is to be with other people he can actually trust. This is a complete contradiction of Kefka’s whole philosophy as the most simple display of the very core of humanity is Gau and all Gau wants is a friend. 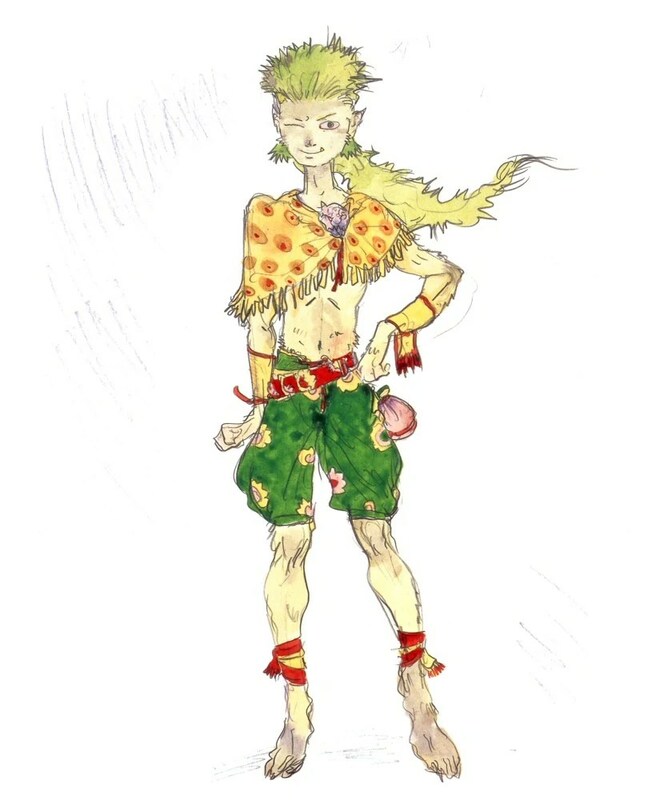 Gau wants unity, connection, trust, and everything else that goes along with a friendship–all of which COMPLETELY contradicts what Kefka is trying to do.